This is a syndicated post. The original appeared on the official NVIDIA Blog on Nov. 2, 2011. Fans are NVIDIA’s life blood. They’re why we come into work. They’re why we innovate amazing products. And they’re why we put on events like last month’s GeForce LAN 6 on the USS Hornet aircraft carrier. It’s vital for us to know what fans are saying – so we can understand how we’re doing and integrate feedback into our products. Social media provides a great way for us to listen to what’s getting said. This is our official social media-monitoring hub, and how we stay plugged into the social web. It also serves as a training center to help NVIDIAns participate in social conversations, using apps like TweetDeck and Spredfast. It also happens to be where I get to work every day, keeping an eye on fans’ comments. I take all their feedback and deliver it to the right people here, whether the comments are good, bad or just for fun. The command center boasts eight 22-inch Samsung monitors on a custom wall-mount, powered by two Quadro NVS 450 professional graphics cards. The wall of monitors makes for an impressive display that attracts lots of visitors, including our top execs. We use watt-stoppers to conserve energy use in the Social Media Command Center when it’s not in use. Whenever we launch a new driver or product, I stay posted at my station to monitor social media traffic, as do others in the customer care and driver teams. When fans have issues, we identify NVIDIA employees who are best suited to help, and mobilize to resolve these issues as quickly as possible. When fans indicate that they like certain features, we try to focus on those in future releases. 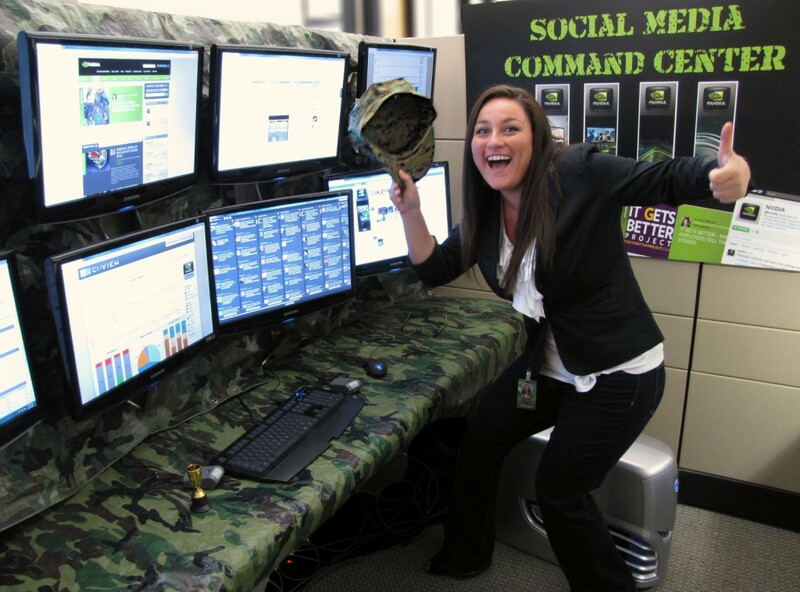 The Social Media Command Center allows NVIDIA to address fan feedback quickly. While we may not be able to answer each tweet or forum post directly, fans should know that we’re reading all your comments and we definitely care. To become a member of one of our community sites on Facebook or to talk to us on Twitter, check out our “find us online” page. It’s a directory of NVIDIA profiles across product families and regional accounts.